The Exquisite Vision of Blind Artist and Educator Ricky Trione. 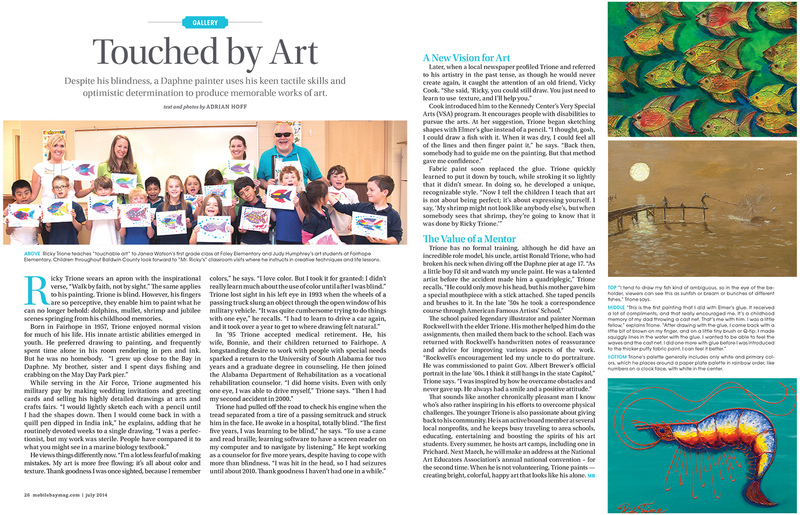 Mobile Bay Magazine article and photos by writer/photographer Adrian Hoff. July 2014. Despite his blindness, a Daphne painter uses his keen tactile skills and optimistic determination to produce memorable works of art. by Adrian Hoff. Mobile Bay magazine, July 2014. The first five years of being blind, I was mainly learning how to be a blind person: learning to use a cane to get around, and to read braille; learning the software that allowed me to have a screen reader on my computer, and to navigate by listening to voices that are very fast talking. Ricky Trione. Ricky Trione is prolific. His colorful paintings brighten many private homes, as well as commercial and public buildings. They are not as detailed as the pen and ink drawings he produced when sighted. But neither are they abstracts, or softly defined impressionistic images. Many depict local sea life, like dolphins, mullet, and shrimp. His popular jubilee scenes spring from childhood memories. But individual creatures’ shapes and structure have been refined by touch. Trione’s perceptive fingers even enable him to accurately paint that which he has never actually seen. I wonder, momentarily, how quickly he’d resuscitate that saleable-stock if he quit accommodating every worthy cause that comes a-calling. But that would be out of character for the sightless artist who keeps nudging our conversation towards more favored topics: like his work in schools, and time spend helping those who are less fortunate than he is. Trione’s palette generally includes only white and the primary colors (red, blue, and yellow), which he initially placed randomly around the perimeter of a paper plate: like numbers on a clock face. His wife and others guided his fingers to the desired color. A precocious 8-year-old schoolgirl changed that about six years ago. Trione has no formal art training. He did have an important mentor: his uncle, Ronald Trione, who had broken his neck diving off of the Daphne pier at age 17. “When I was a little boy I’d sit and watch my uncle paint. He was a talented artist before his accident made him a quadriplegic,” Trione recalls. “His mother gave him a special mouthpiece that had a stick attached. She taped pencils and brushes to it. In the late '50s he took a correspondence course through the American Famous Artists’ School,” he continues. That sounds like a chronically pleasant sightless man I know who’s also rather good at overcoming obstacles. He is an active board member at local charitable organizations. His March 2015 address at the National Art Educators Association’s National Convention in New Orleans will be an encore appearance: he also presented at its 2009 National Convention in Minnesota. He’s scheduled to work with 40 Elementary School Teachers in Loxley this month: at a University of South Alabama-sponsored "Arts in Education Workshop" directed by USA’s Dr. Paige Vitulli. When not promoting the arts in education, or educating aspiring young artists, Trione somehow finds time to paint — to create bright, colorful, happy art that looks like no one else’s. Dad & Cast Net: This is the first painting that I did with glue, which I really got a lot of encouragement for. It’s a childhood memory of my dad throwing a cast net. That's me with my dad. I was a little fellow,” explains Trione. “You can feel the Elmer's glue. And after I did the glue I just came back in with a little bit of a brown on my finger, and on a little tiny brush or a Q-tip. I actually made little squiggly lines in the water, with the glue. The only way that I am able to view them is with my fingers. I wanted to be able to feel the waves, and the cast net. I received a lot of compliments on it. That really encouraged me. I think I did one more with glue, and then I was introduced to the puffy paint. Fabric paint. I really like its thickness. I can feel it better. 3a, 3b – Fish Paintings: I tend to draw my fish kind of ambiguous, kind of generic. So in the eye of the beholder, viewers can see this as a sunfish, as a bream: it could be bunches of different fishes. Mullet is something that I saw and felt as a kid. I remember the shape of the head, the way they swim. I’ve learned how many fins they have. I’ve done several paintings called The Eastern Shore Mullet School. All have sold. Foley & Fairhope School Visits (02a-02g) - Ms. Watson’s 1st grade class @ Foley Elementary and Judy Humphrey ? grade Fairhope Elementary art class, with Trione’s “touchable art.” At Foley Elementary, they started about three months ago, sending students home with information about me. Each child had to pay $3 to do art with Mr. Ricky. I usually get $300 for a whole day at the school. On days where they take in more, the balance goes to school to buy supplies. At Spanish Fort Elementary last week, my average day was seven classes. There were two days where I had eight. Students in kindergarten through third grade had 30-minute classes; fourth and fifth graders got 40-minutes. With those younger students, in order for me to tell my story; talk about my talking watch; they want to see what my eye look like; they ask questions, and then we do the art. It's like crunch time. We're working fast. There are students waiting to come in while we're getting them out. We really stayed busy. A lot of the third graders said, Mr. Ricky, the last time you were here I was in the first grade. And some of them had been at other schools and transferred in. Two of them said Mr. Ricky, I saw you at Loxley Elementary last year.” Hallway Paintings 02b = Trione’s work displayed in a hallway, adjacent to the school library’s Ricky Trione Reading Room, where fishes, red fishes, jellyfish, shrimp, and other Trione originals are permanently displayed.